(CNN) — Prehistoric paintings of antelope, snakes and giraffes that have survived for around 5,000 years are now under threat from looting and a lack of protection. The rock paintings, which include renderings of dogs and sheep as well as human figures, were discovered at Dhambalin, in a unique sandstone shelter close to the Red Sea in Somaliland, a breakaway state from war-torn Somalia. They were found by Dr. Sada Mire in 2007, in what she says was first ever survey initiated and led by a Somali archaeologist in the region. 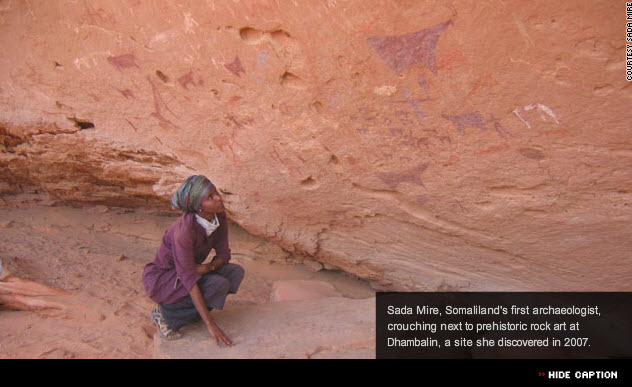 Since then, Mire has discovered 100 cave and rock art sites across Somaliland, but they need desperately to be preserved.